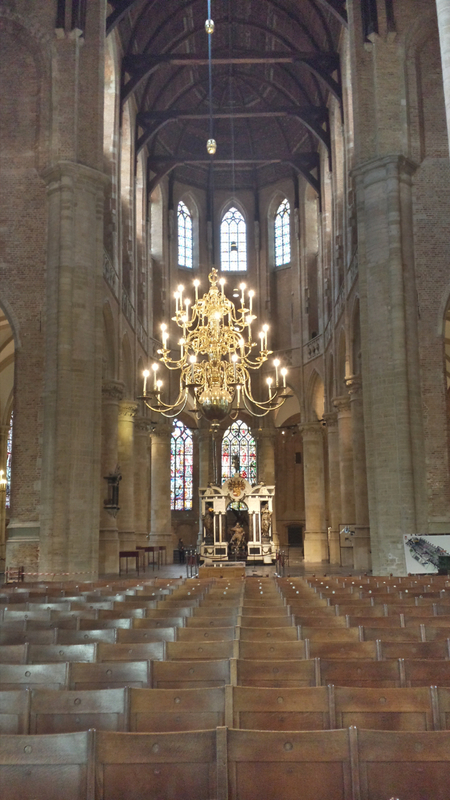 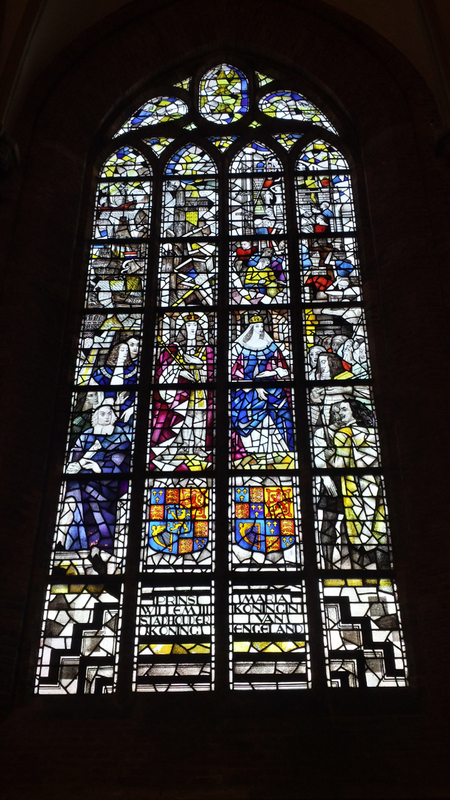 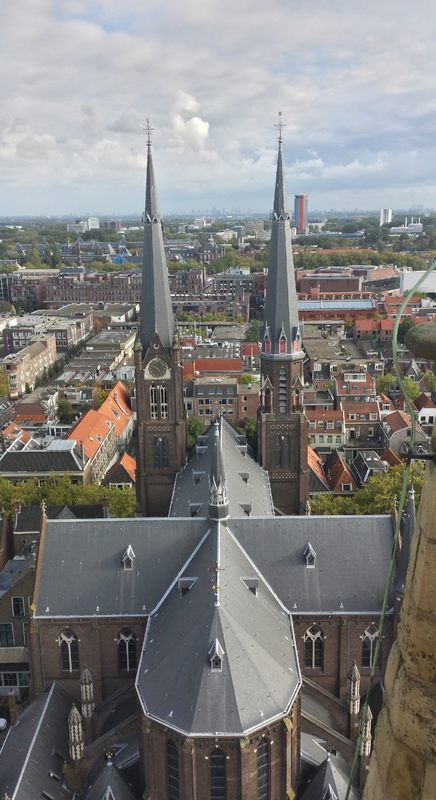 I also had a lot of fun exploring Delft — the city is very old, and has a lot of really cool history, including a couple of neat churches — the Nieuwe Kerk (or New Church, though construction actually started in 1396) and the Oude Kerk (or Old Church, which dates to 1246). 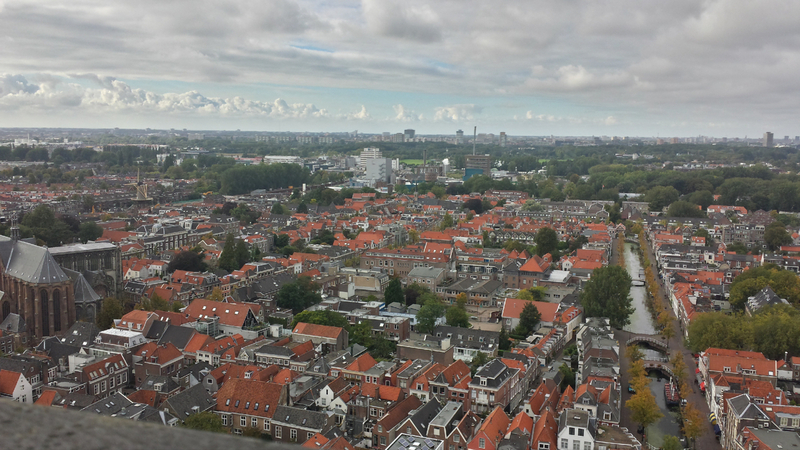 I also got to see more modern buildings (like the University library, which is a giant cone built into a hillside) as well as very small ones at Madurodam, which is a theme park that has 1:25 scale replicas of famous Dutch buildings, roads, ships and trains. 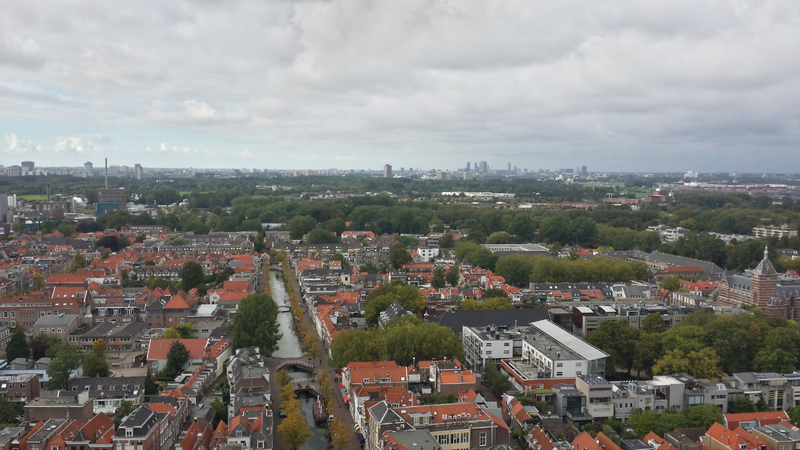 It was really nice to have nearly everything in the city easily accessible by foot, though I felt like I was always at risk of getting run over by people on bicycles, which was quite a change coming from the US. 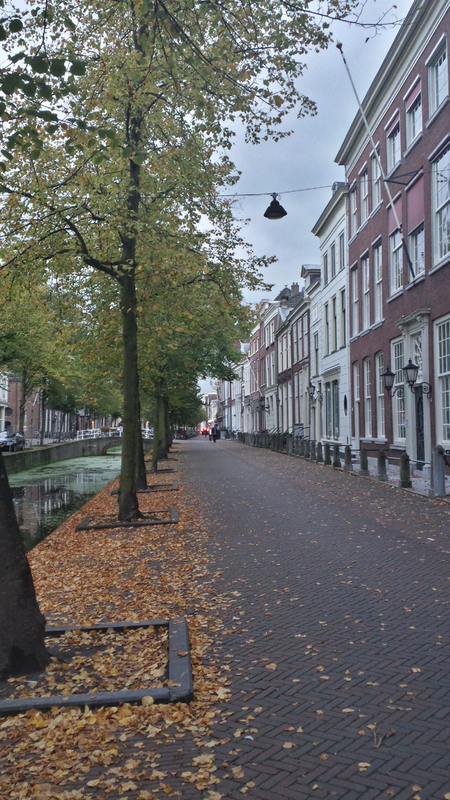 The canals (and accompanying ducks and geese) around which the sidewalks and streets were laid out were also a very pleasant change from the more mundane Kansas. 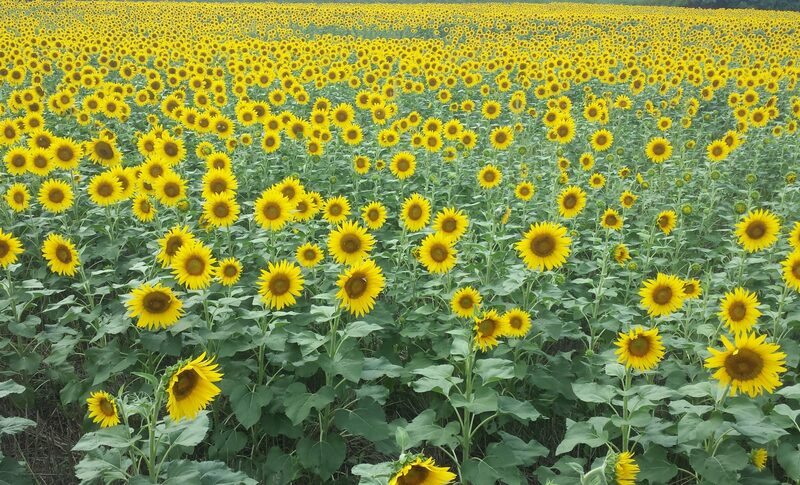 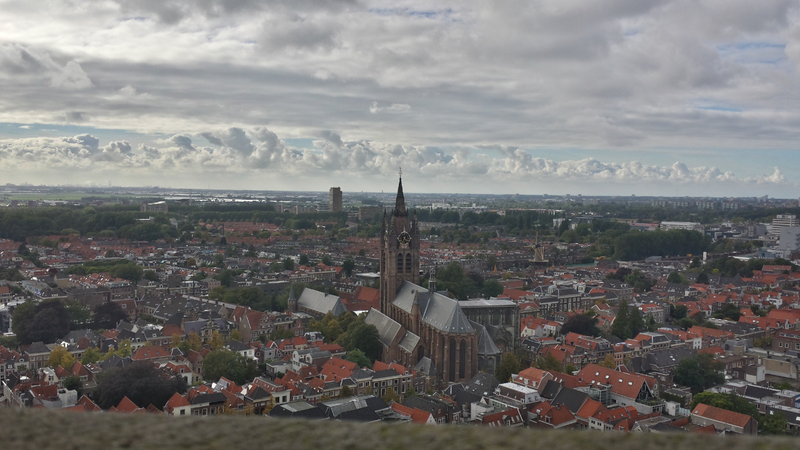 All in all, it was a great trip, and I learned a lot — both about safety critical computing, and about the history of the Netherlands. 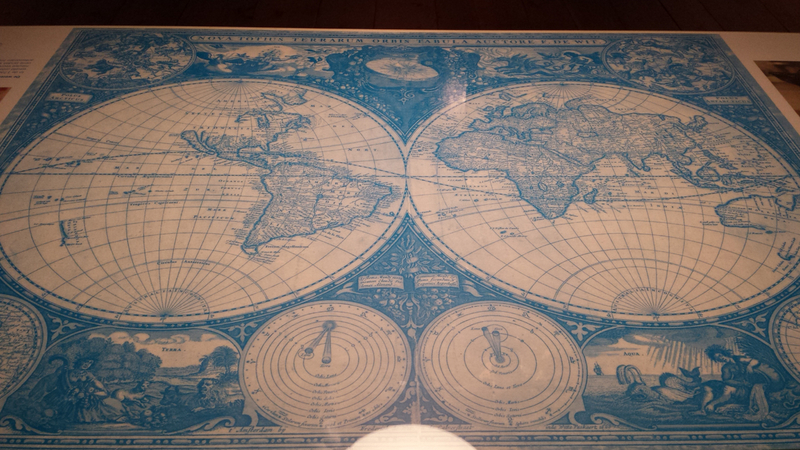 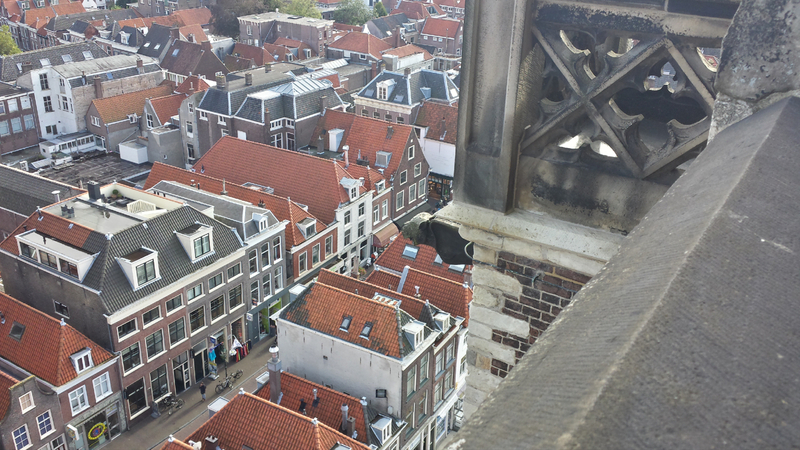 You can check out the photos I took below! 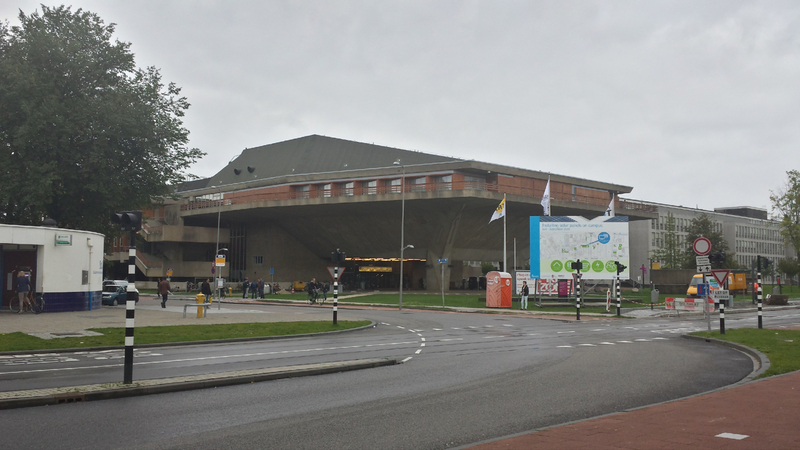 The Aula Congrescentrum, where my conference was held. 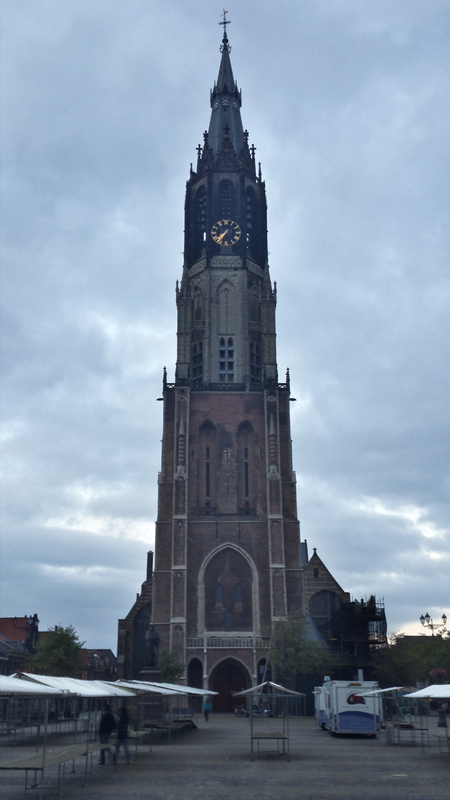 It's a pretty impressive looking building, very much in the brutalist style. 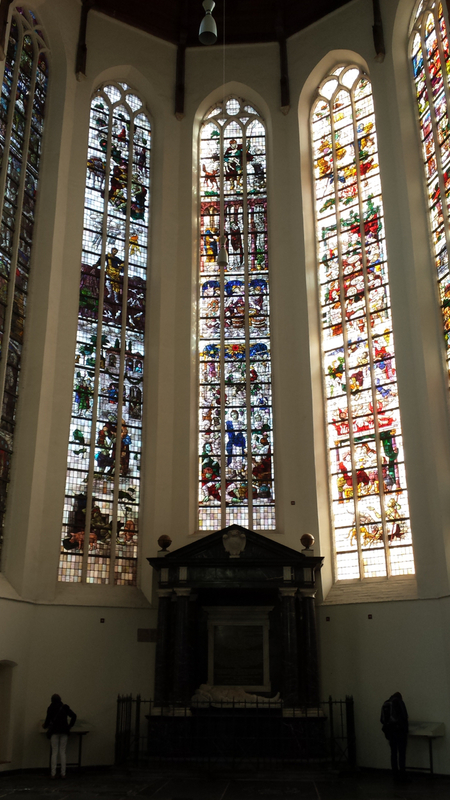 The "Senaatszaal" where the actual conference was held. 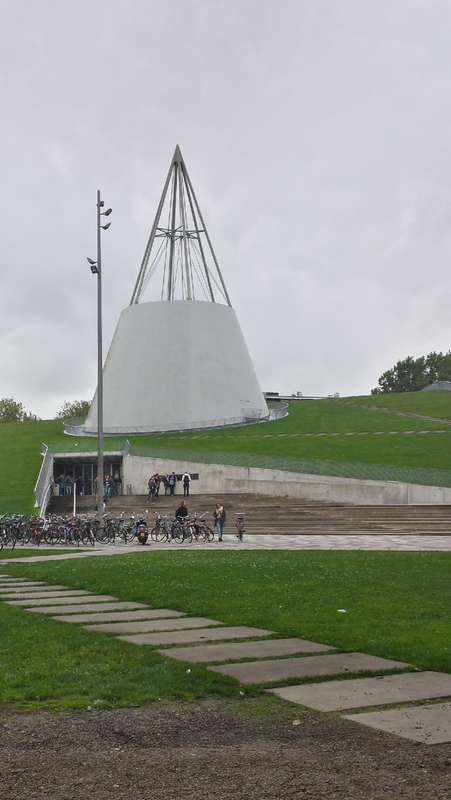 Delft's university library is a striking modern structure built into a hill. 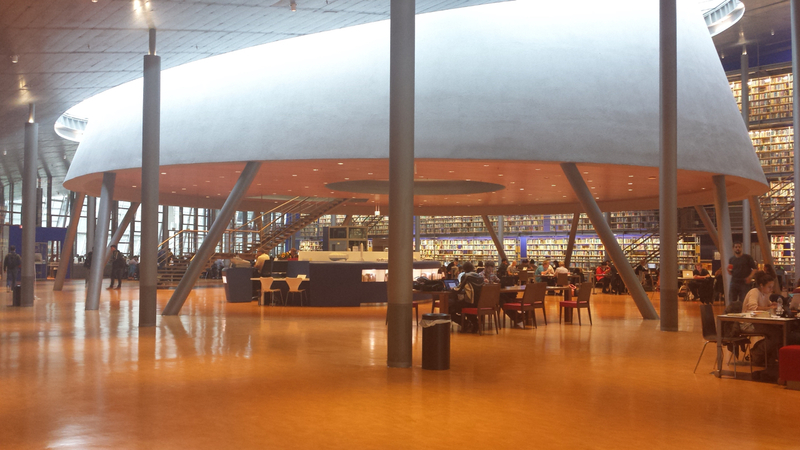 The cone section contains 5 concentric rings of study areas, and the top is a skylight. 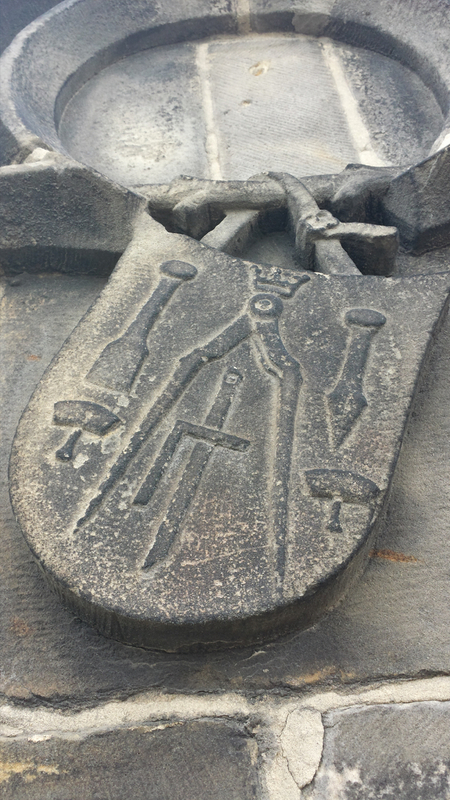 The university library, this shows the base of the cone which extends up through the lawn. 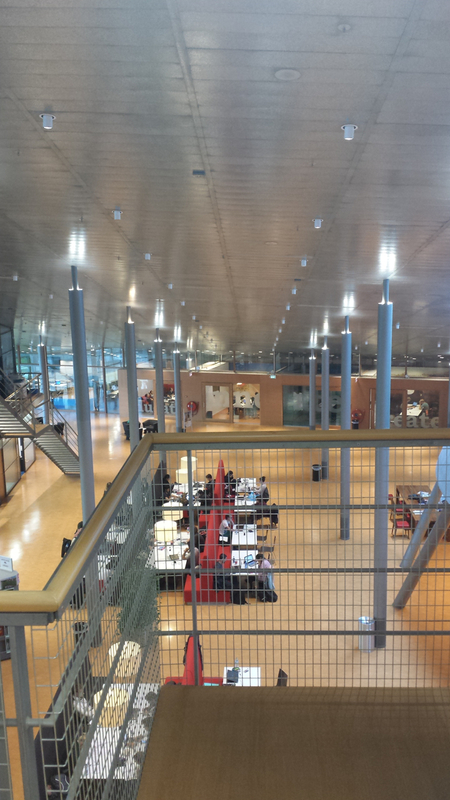 A view of the university library from inside -- this shot is "inside" the hill looking out. 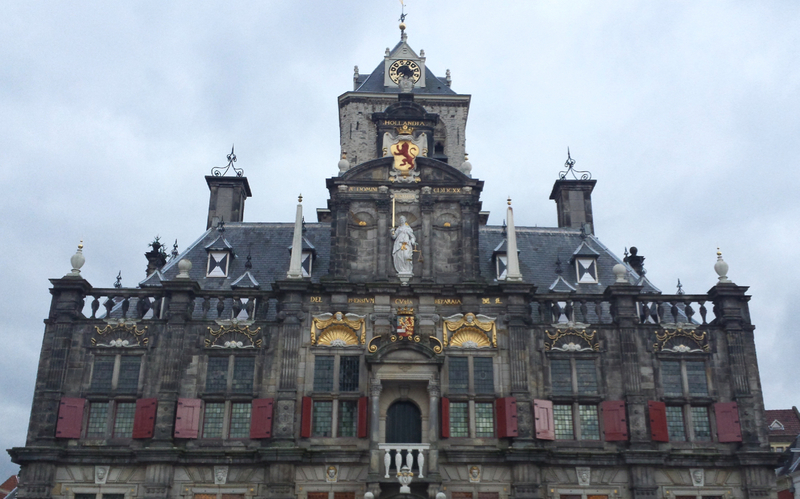 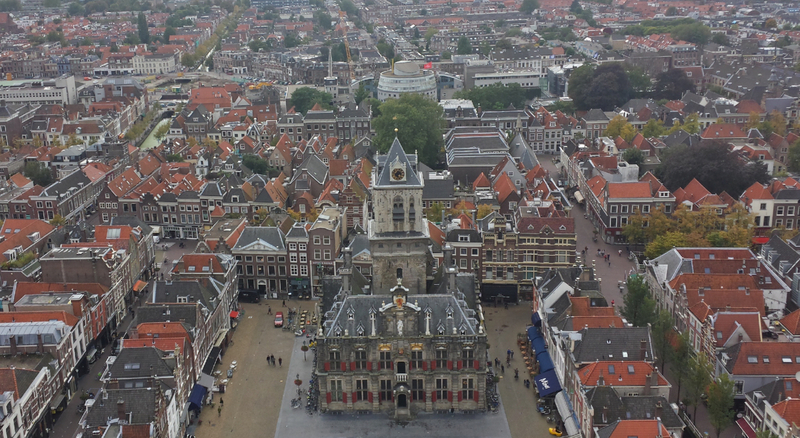 Delft's town hall, viewed from the ground. 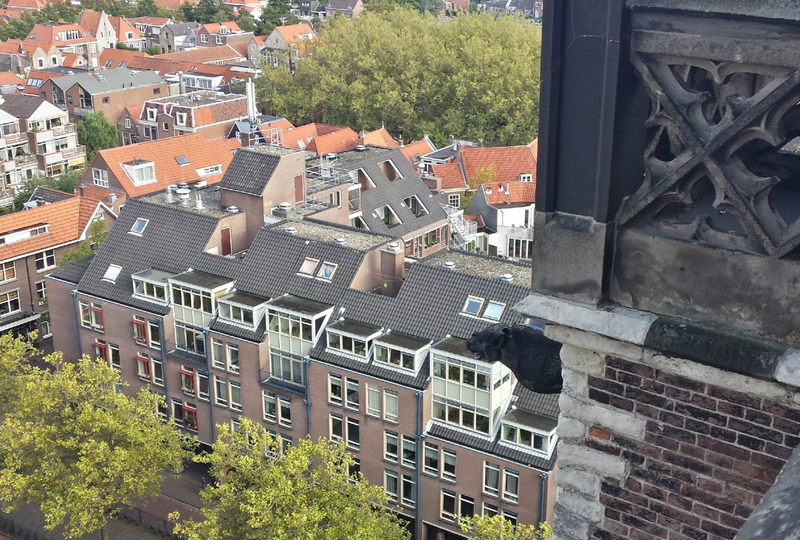 Some of the apartments in Delft are over 500 years old. 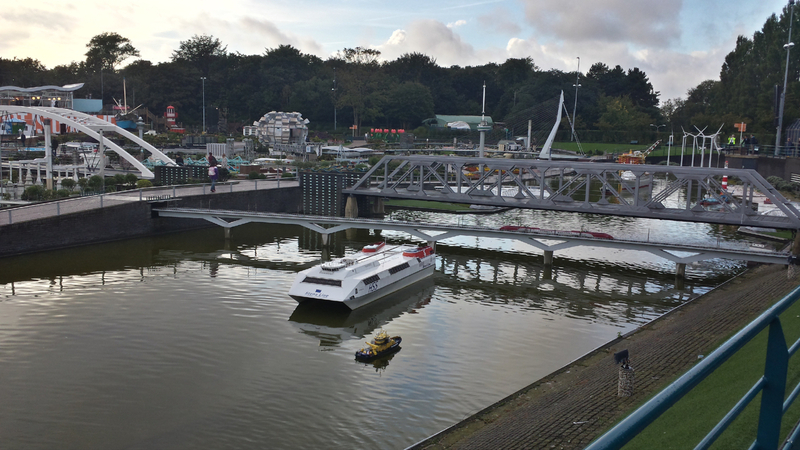 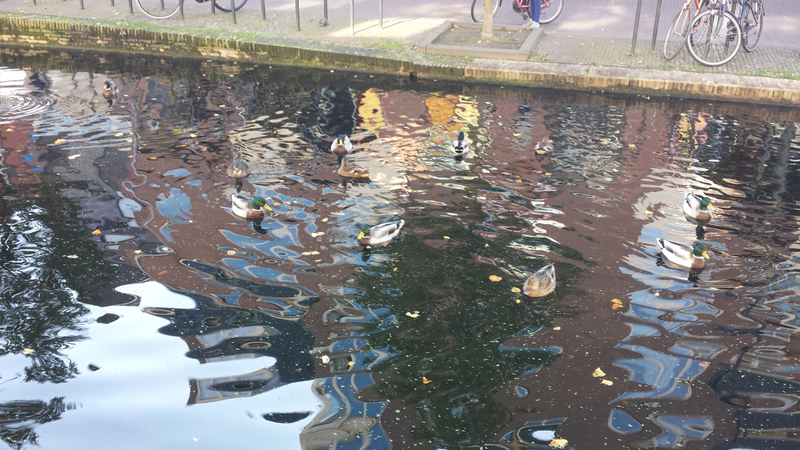 Where there are canals, there are ducks. 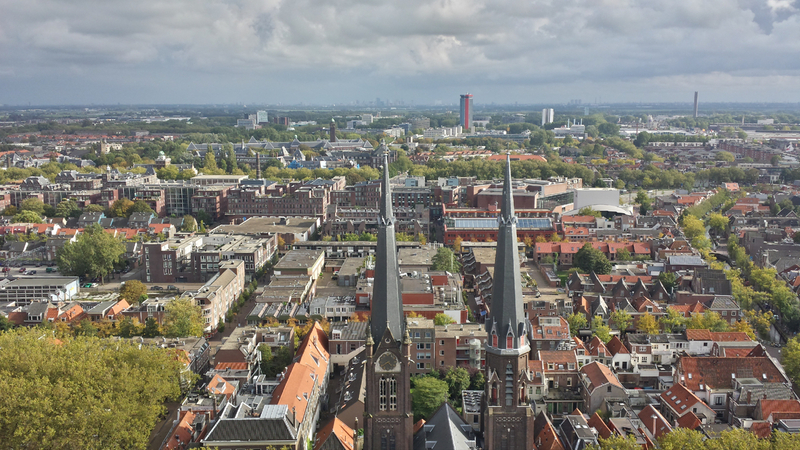 This is the "parking lot" of the Delft train station. 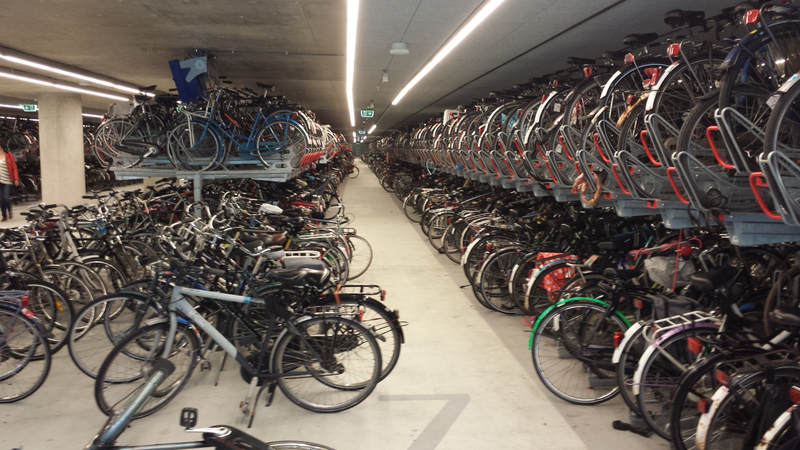 There are a number of rows just like this, it's a pretty breathtaking number of bicycles. 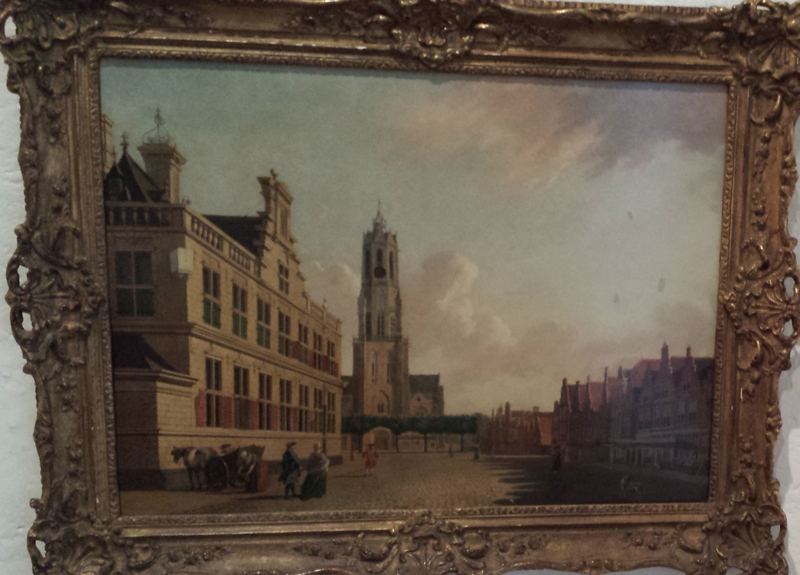 This 18th century painting by Johanne Huibert Prins shows Delft's market square, which has had a market every Thursday since 1246. 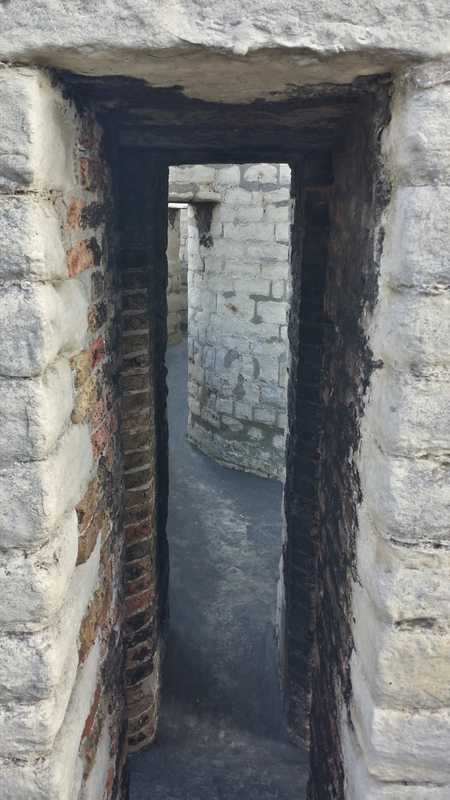 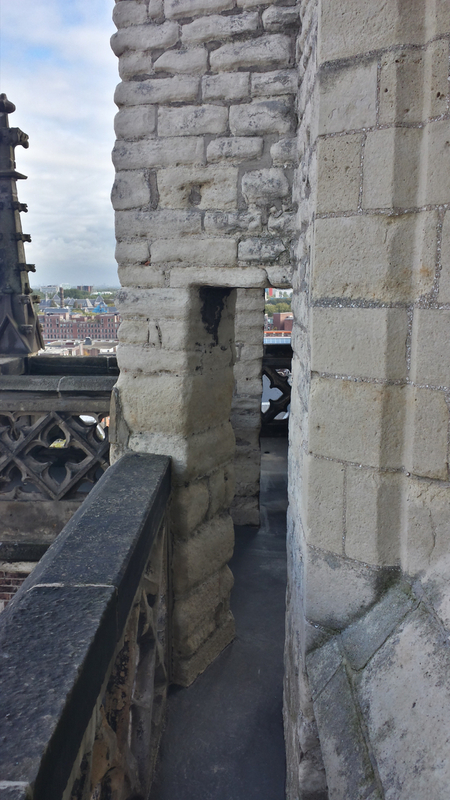 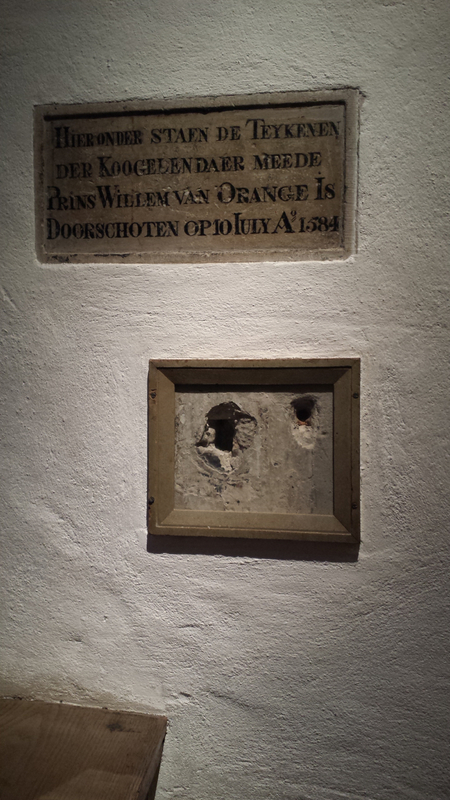 These holes were from the gun of Balthasar Gérard, who assassinated William of Orange at this spot in his house (now known as the Prinsenhof) on July 10, 1584. 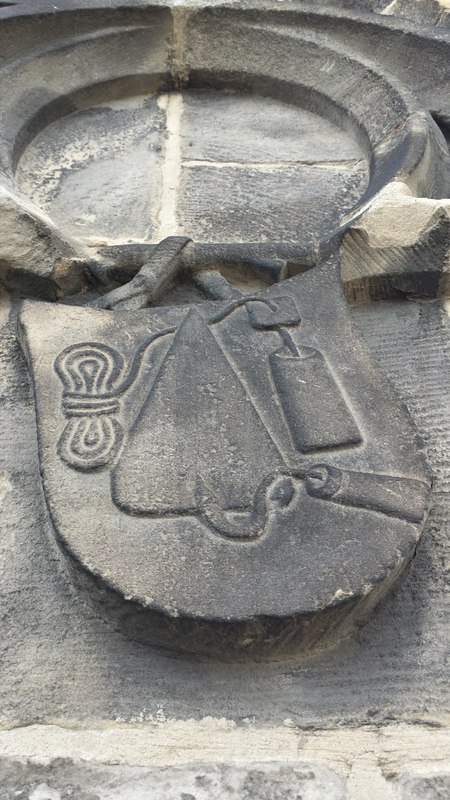 It was the first assassination where a handgun was used. 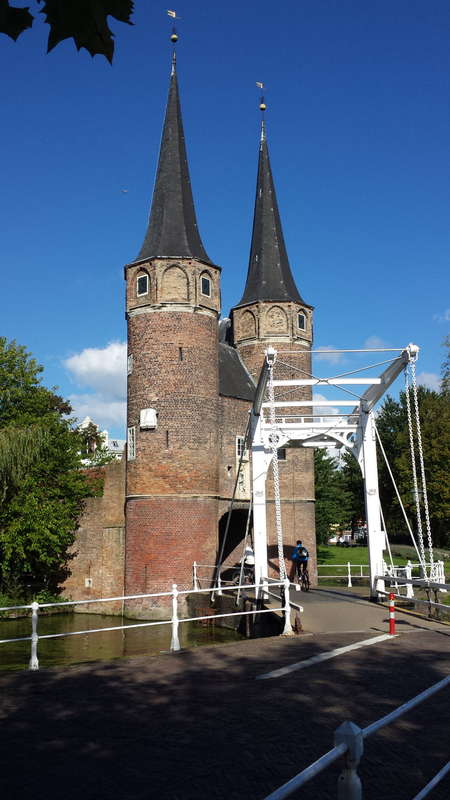 This is the Oostpoort, or Eastern Gate, in Delft. 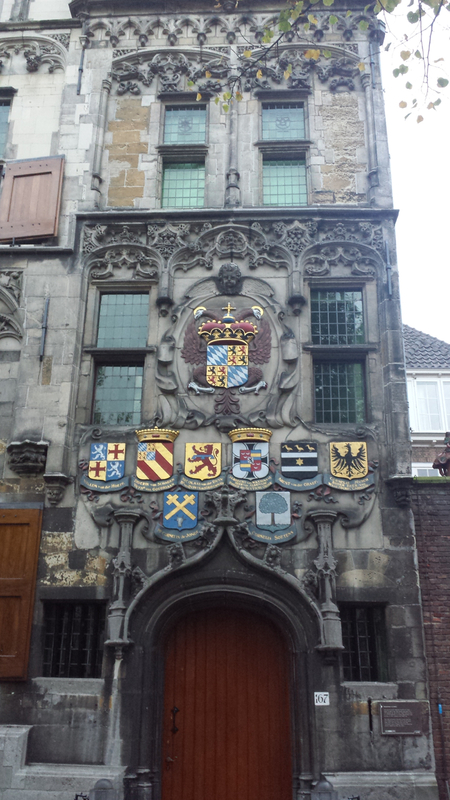 It was built near 1400, and is now a private residence. 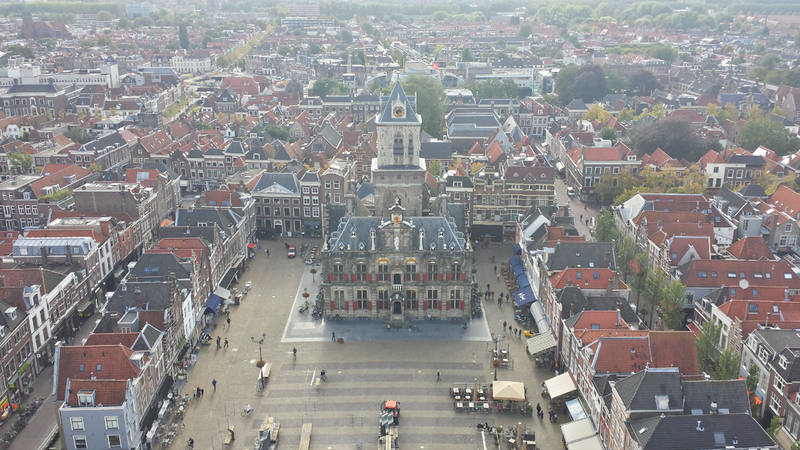 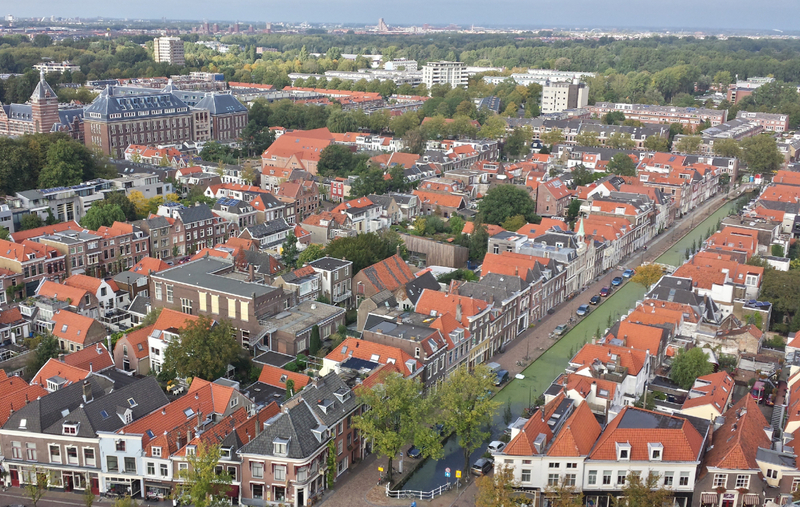 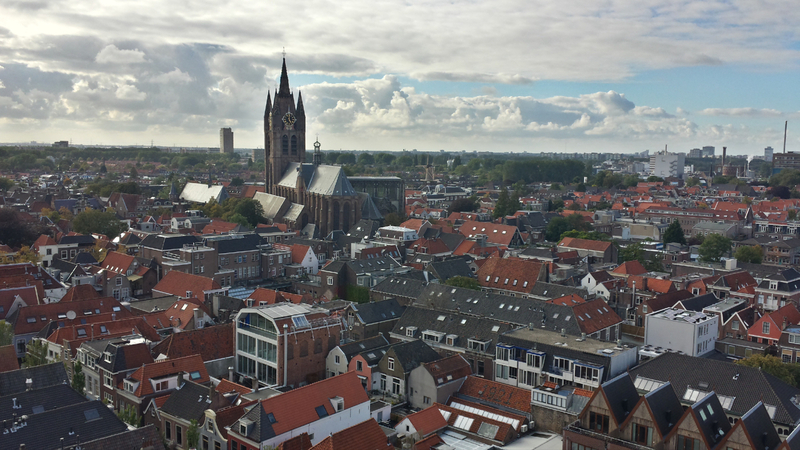 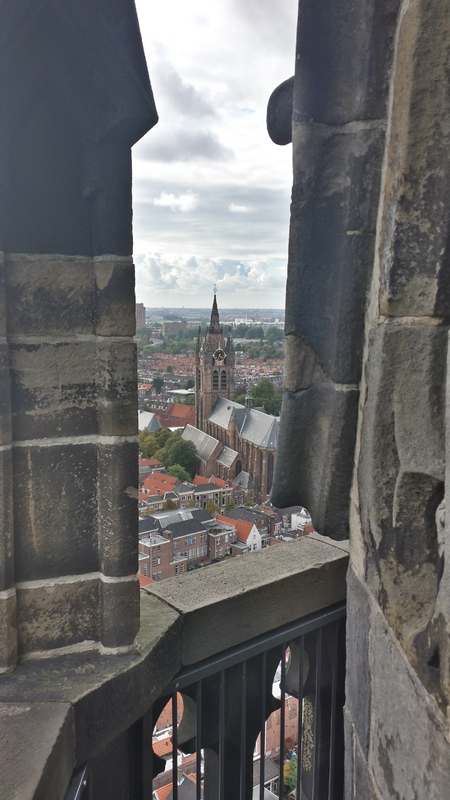 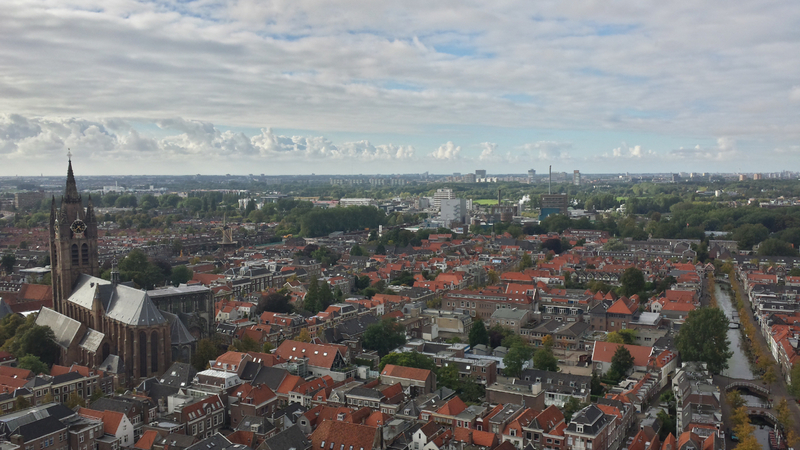 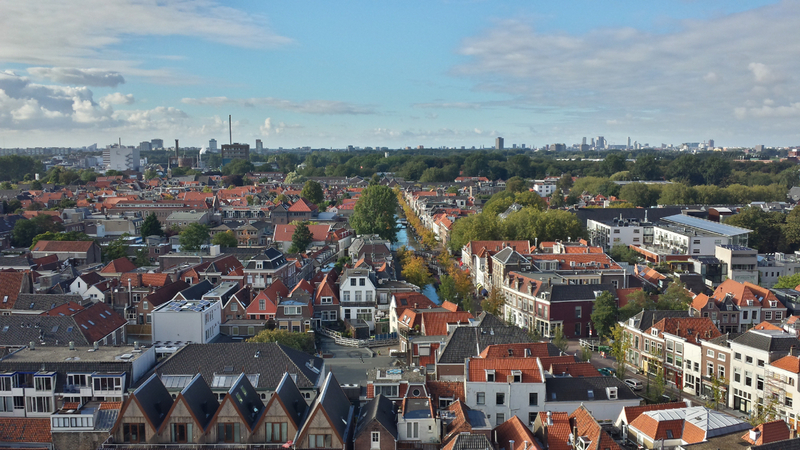 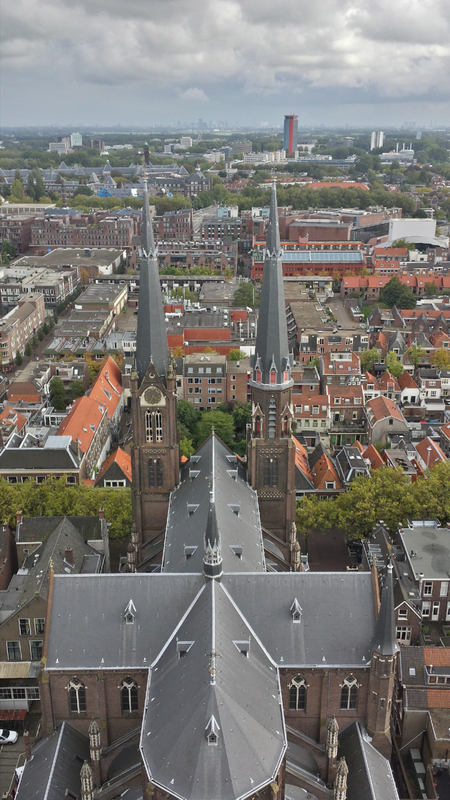 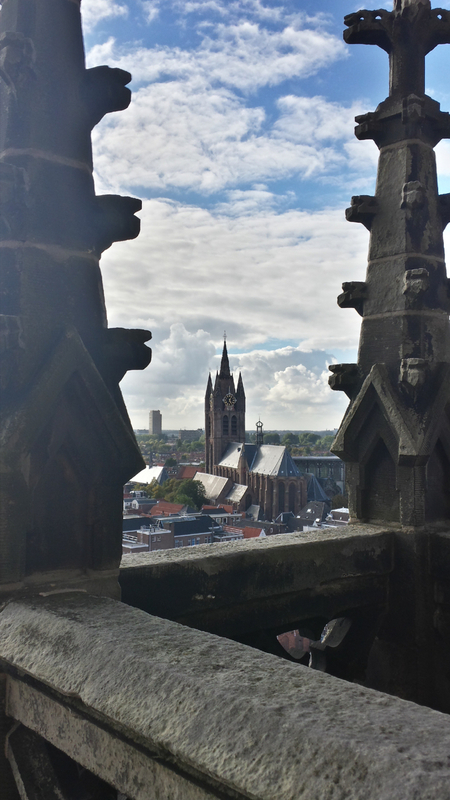 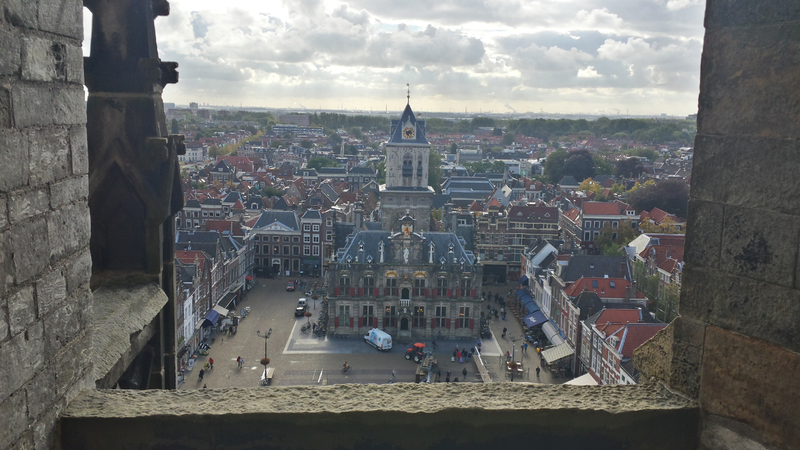 A view of the Delft town hall from the highest level of the Nieuwe Kerk's (New Church's) belltower. 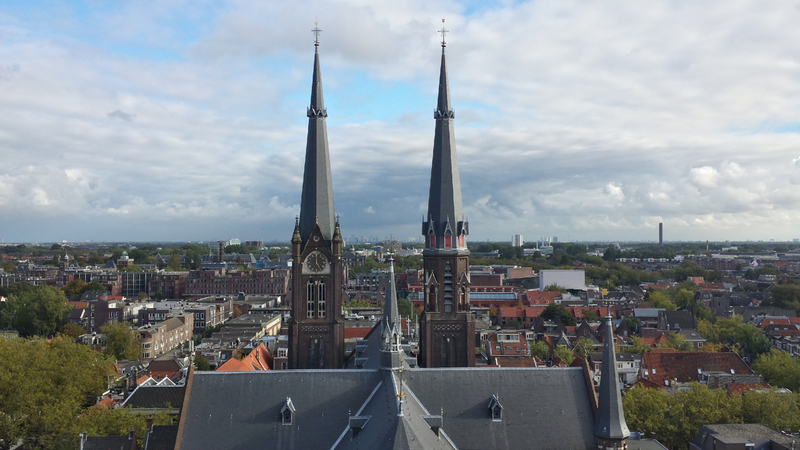 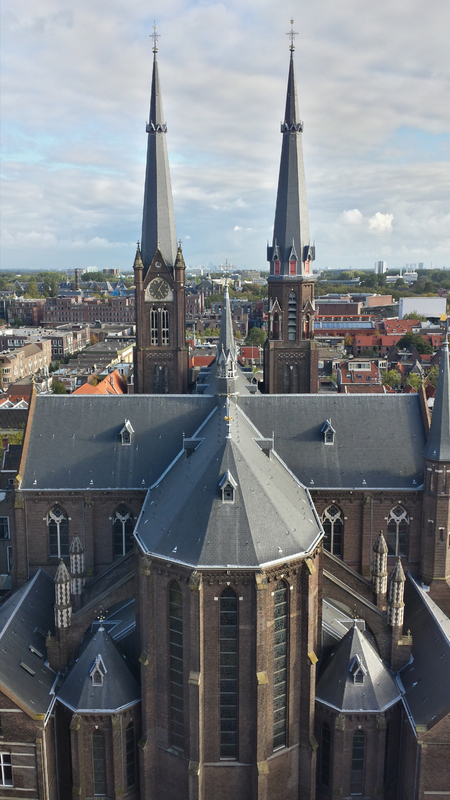 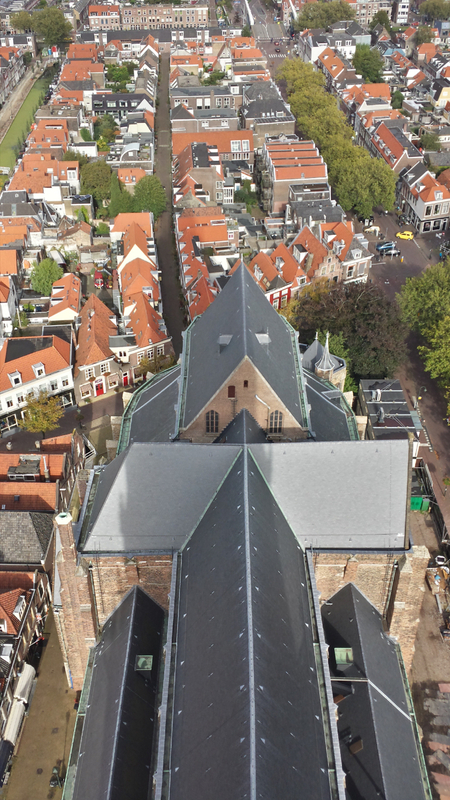 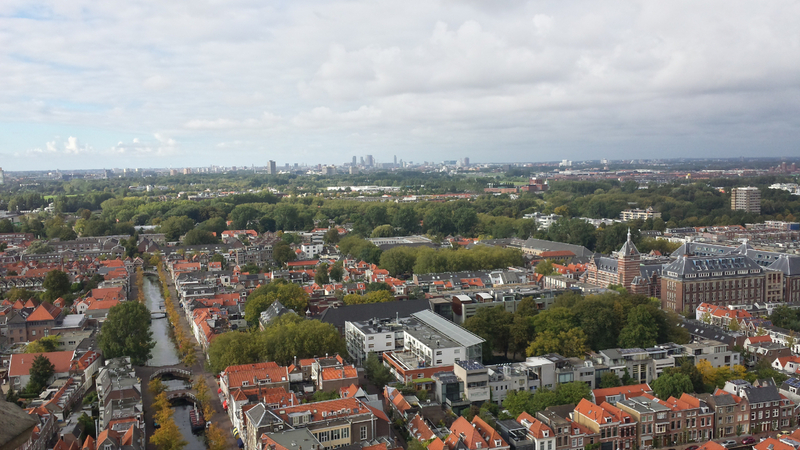 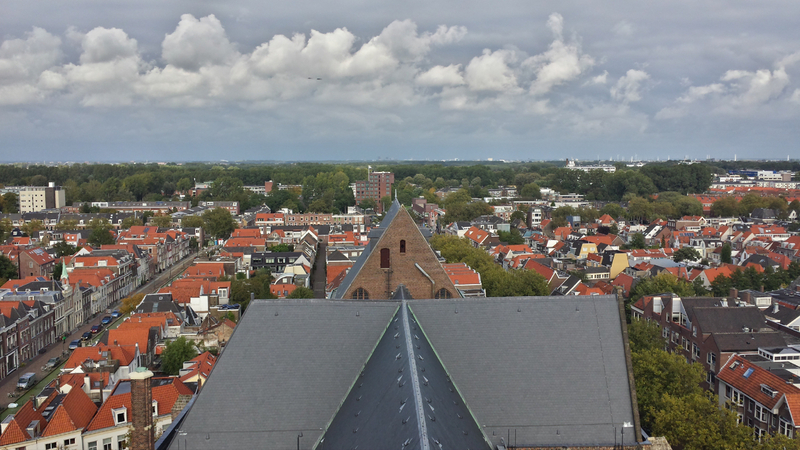 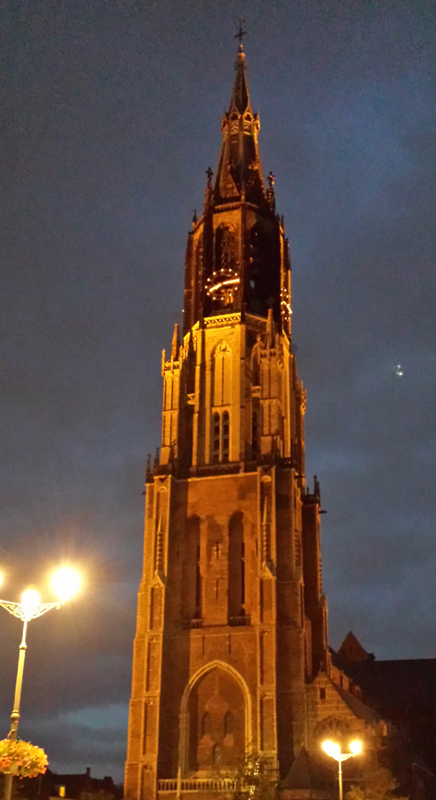 The Nieuwe Kerk itself, viewed from its belltower's highest level. 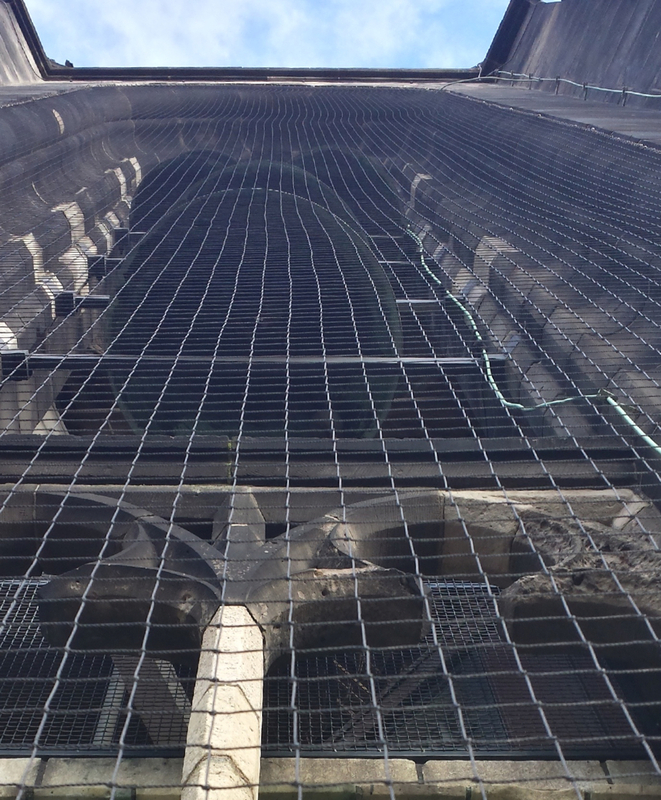 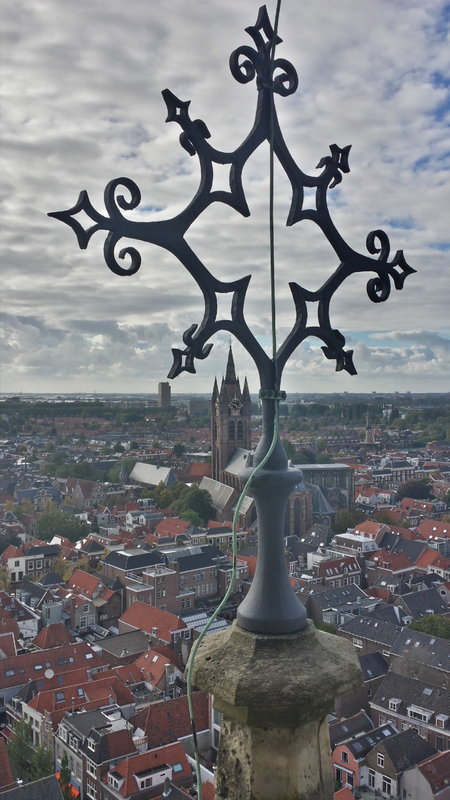 Some ironwork, with the Oude Kerk in the background. 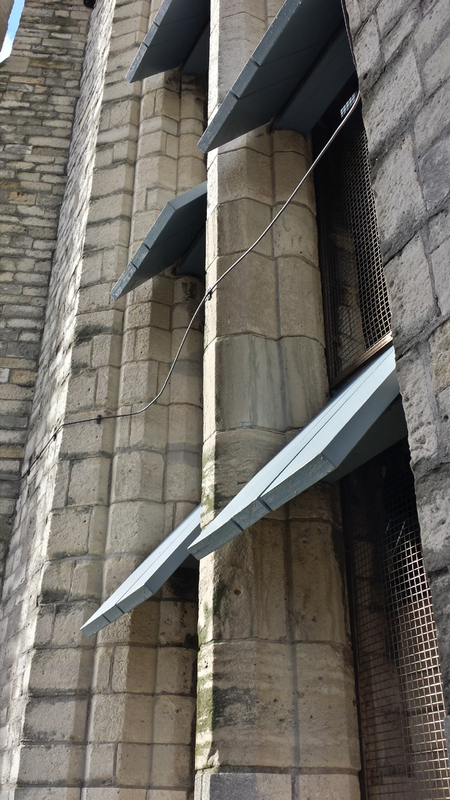 All the points had (what I assume to be) lightning cabling running off of them. 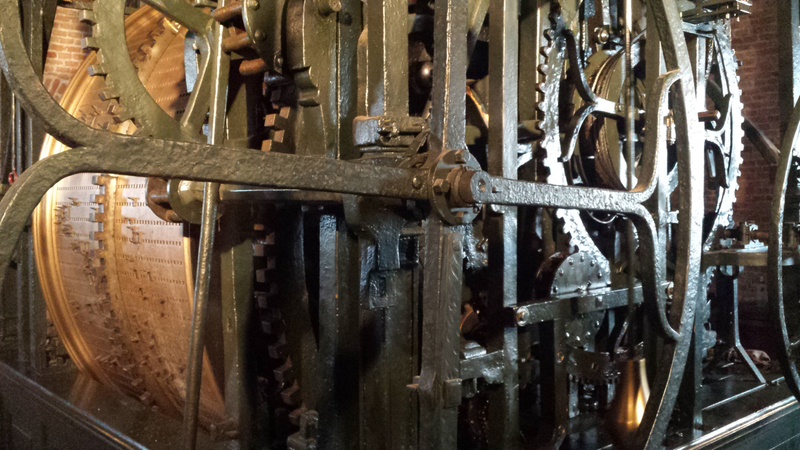 Some of the machinery operating the belltower's clock. 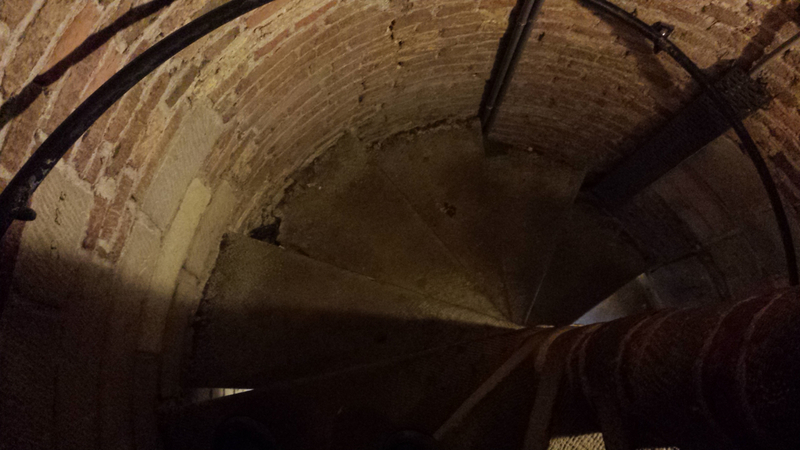 Squeezing through these arches was pretty tough at times -- they weren't built for super tall people. 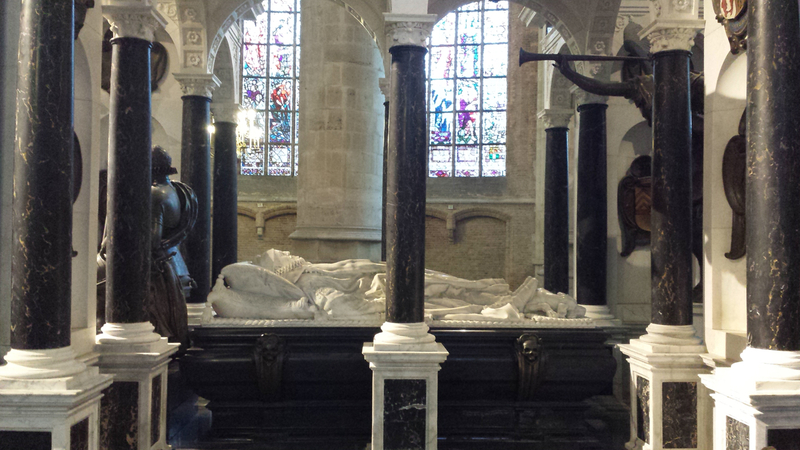 A view of the church lengthwise, with the tomb of William of Orange in the distance. 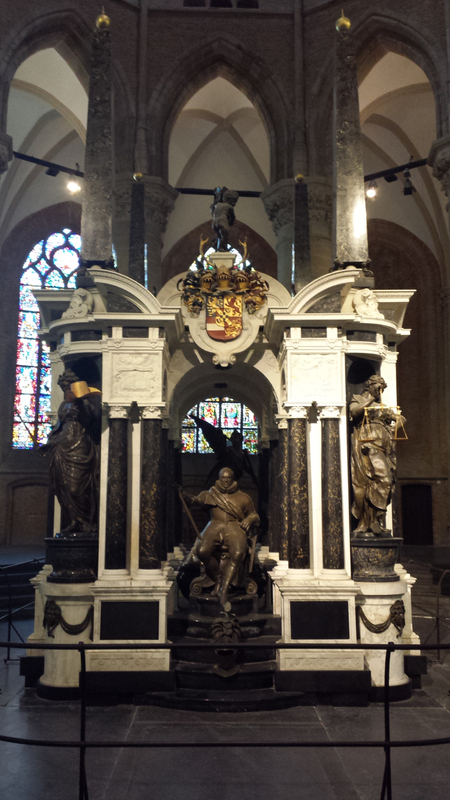 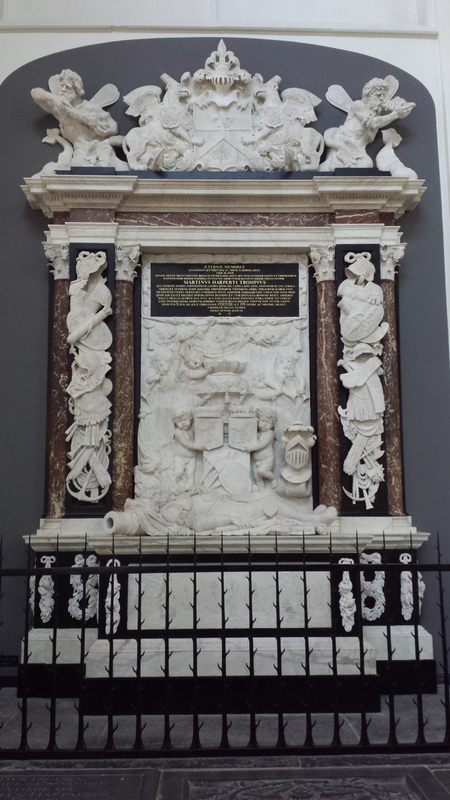 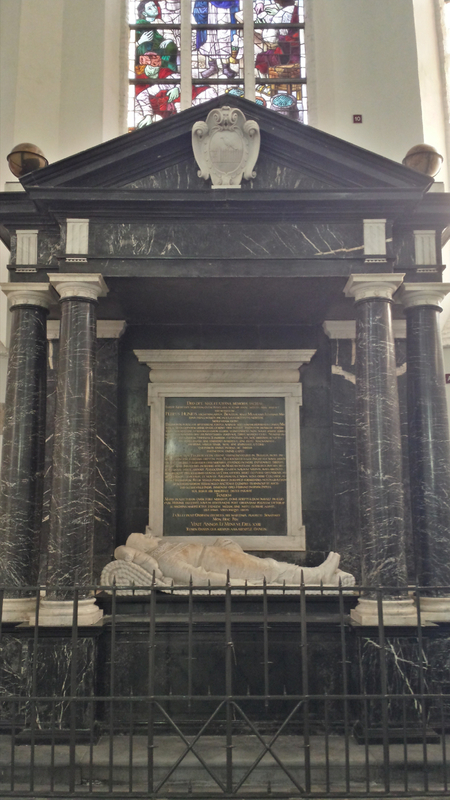 The tomb of William of Orange. 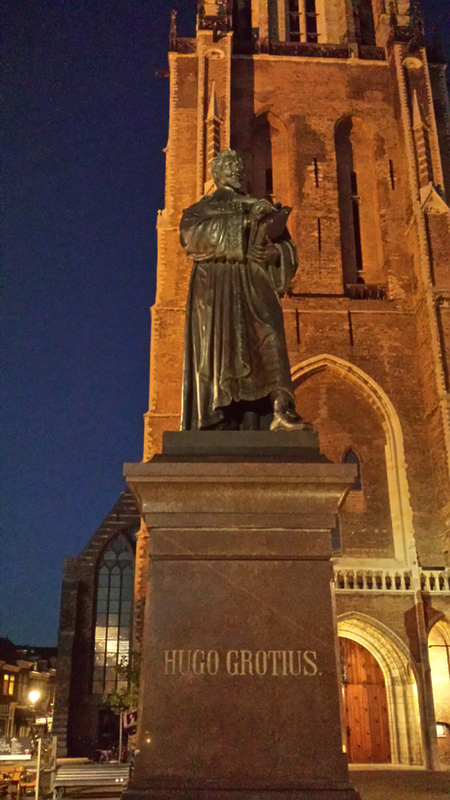 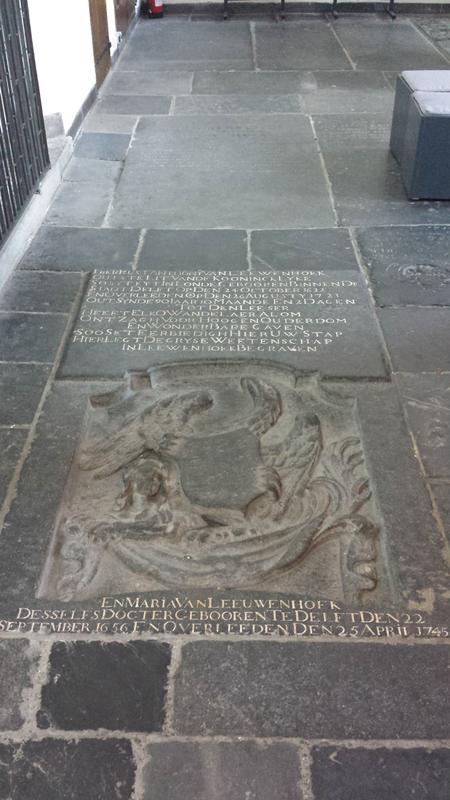 The tomb of Hugo Grotius. 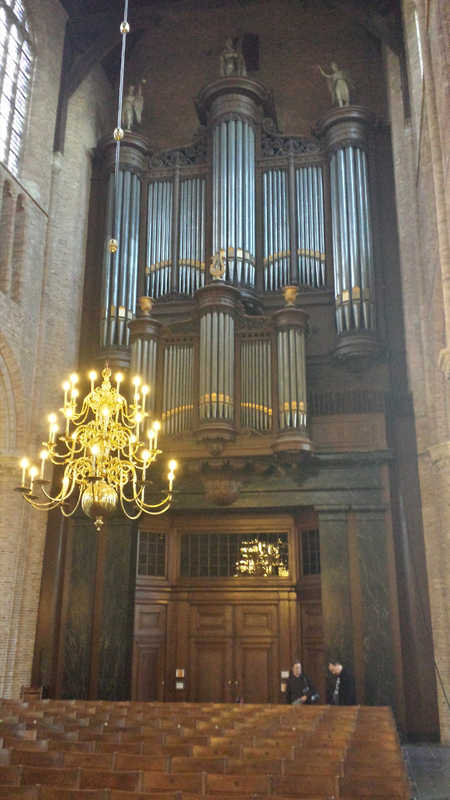 The church's large pipe organ. 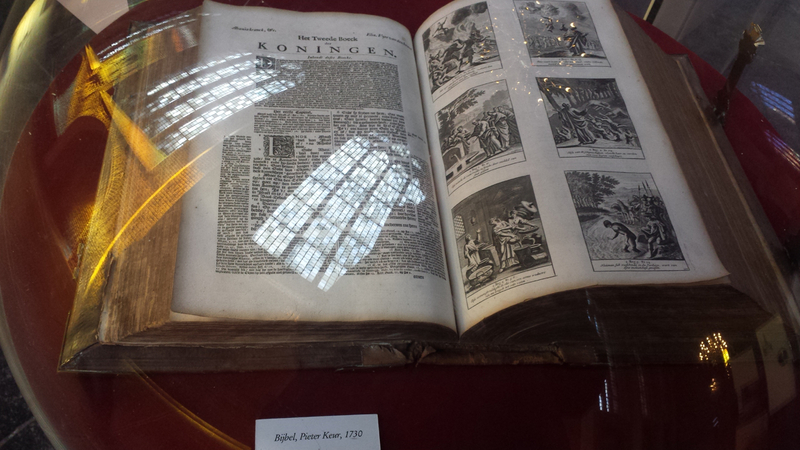 The church had a number of old bibles, like this one from 1730. 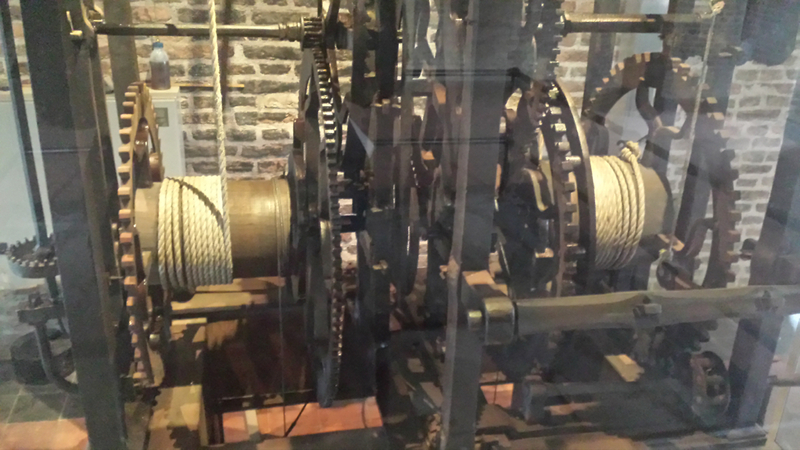 Some of the machinery that makes the clock in the Nieuwe Kerk run. 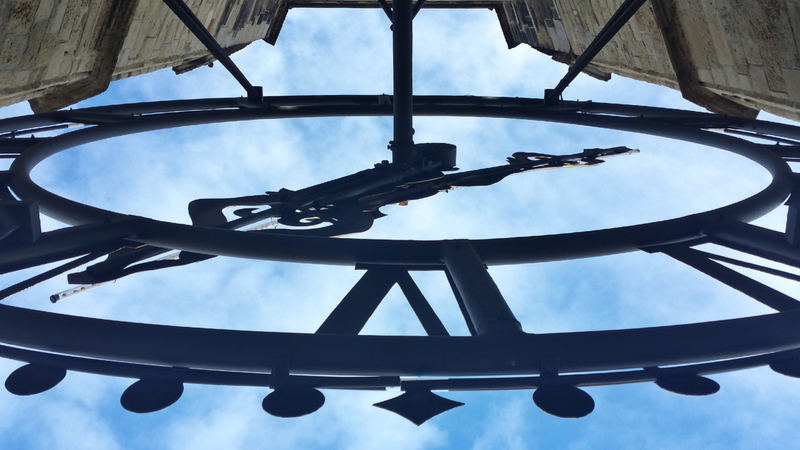 It dates to 1662 (when it was probably the first new pendulum-driven tower clock), but was dismantled in 1938 and then restored in 2004. 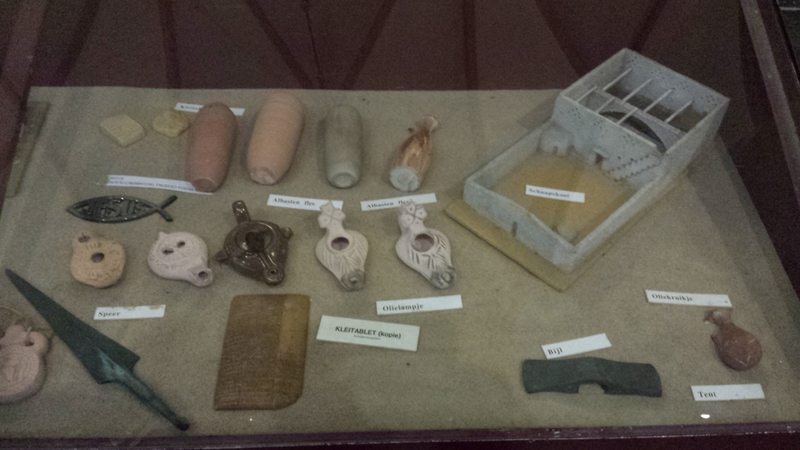 Artifacts of the church, and a chromed Jesus fish for your car. 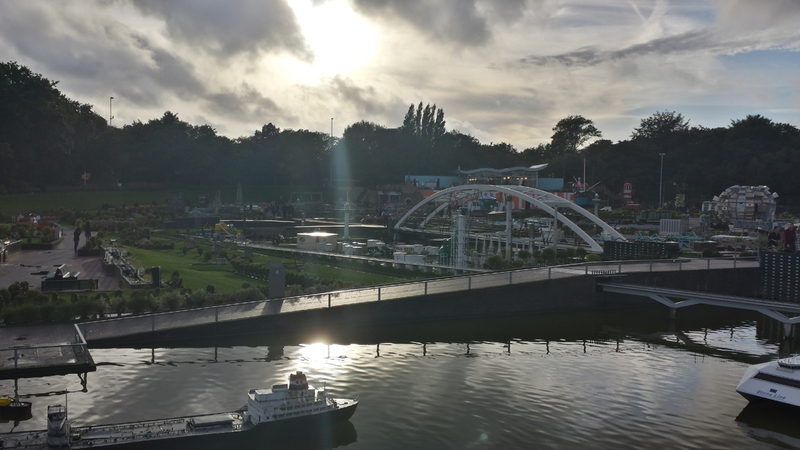 Madurodam's river and a number of its structures. 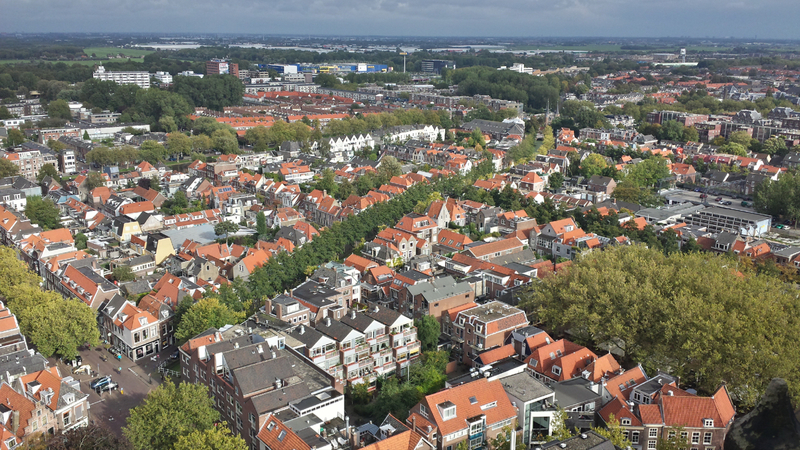 Madurodam is a children's theme park in the Hague that has 1:25 scale replicas of a number of the Netherland's most famous structures. 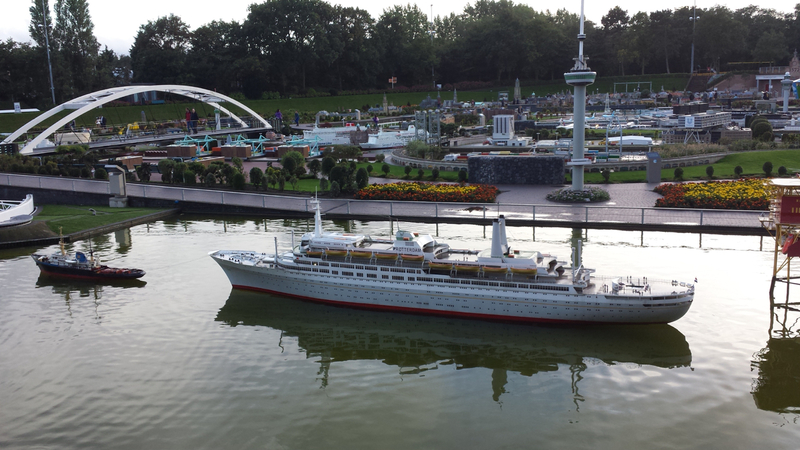 Even at 1:25 scale, the size of some of the models is really impressive. 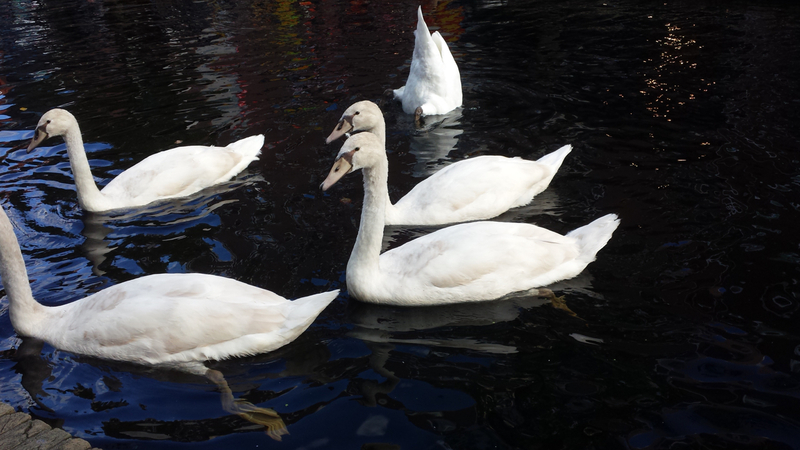 There are also activities for the children (or other guests!) 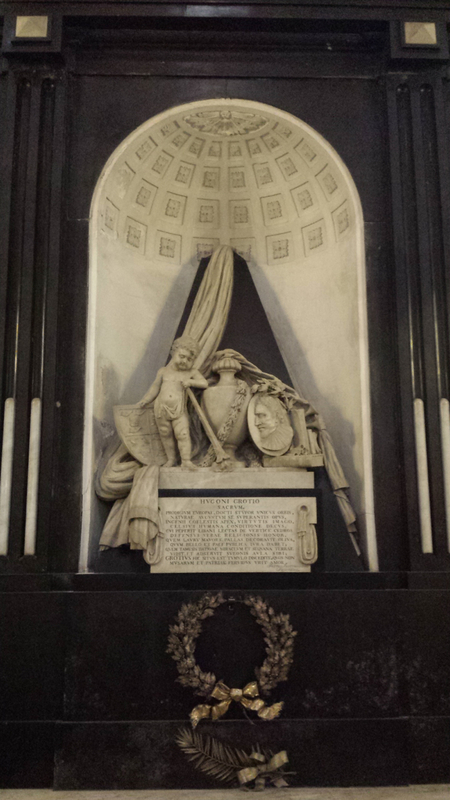 to do. 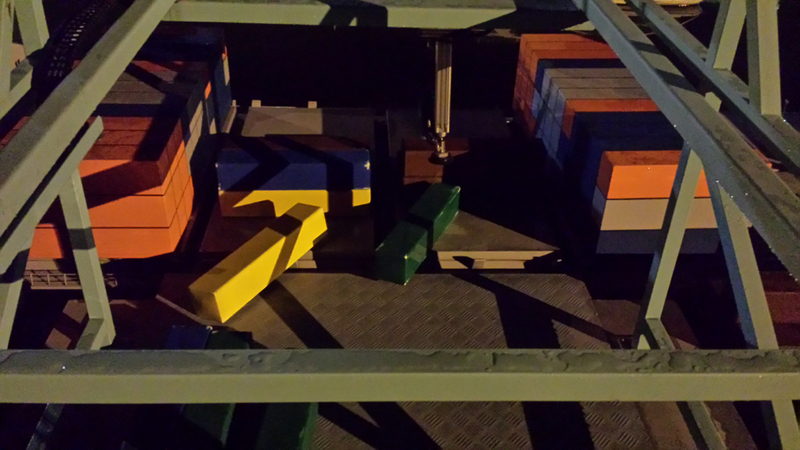 Shown here is the green shipping container a friend and I managed to maneuver mostly onto the cargo ship using a large pneumatic grabber. 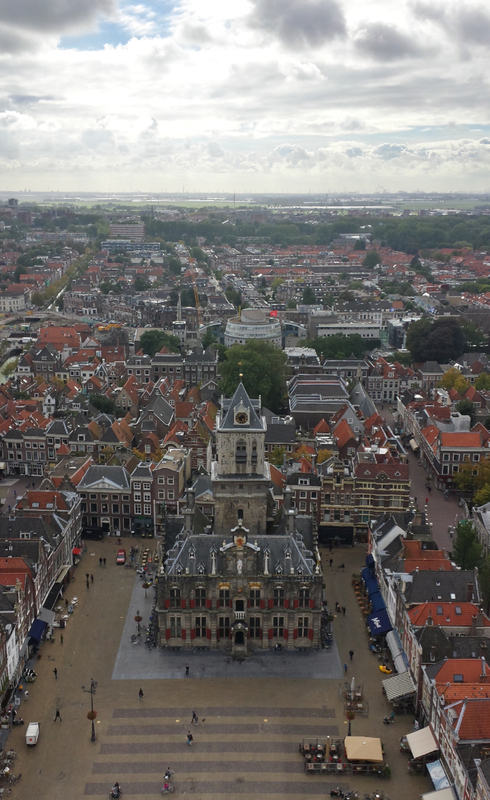 They have lots of 1:25 scale models of people walking around as well -- and a 3D scanner that, together with a 3D printer, can make a customized model of yourself. 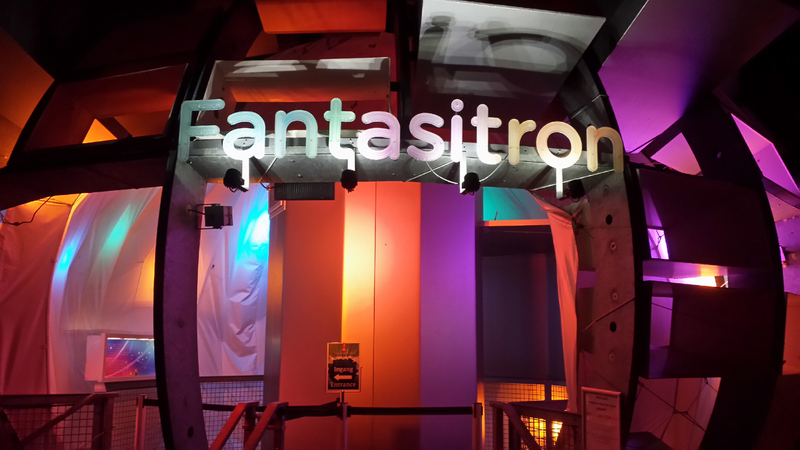 The scanner, shown here, is called the "Fantasitron." 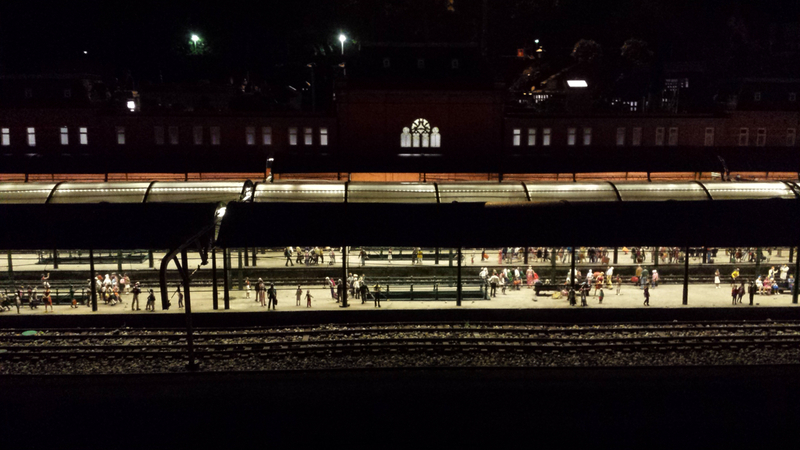 At night the lights of all the structures turn on -- most get harder to photograph, but this train station turned out pretty well. 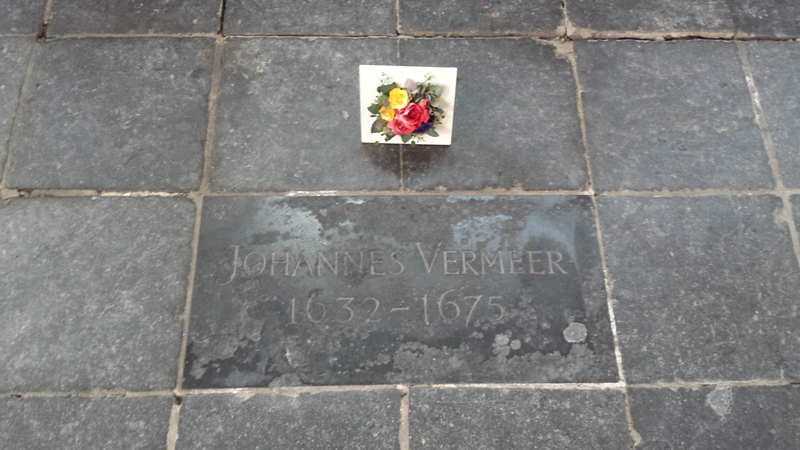 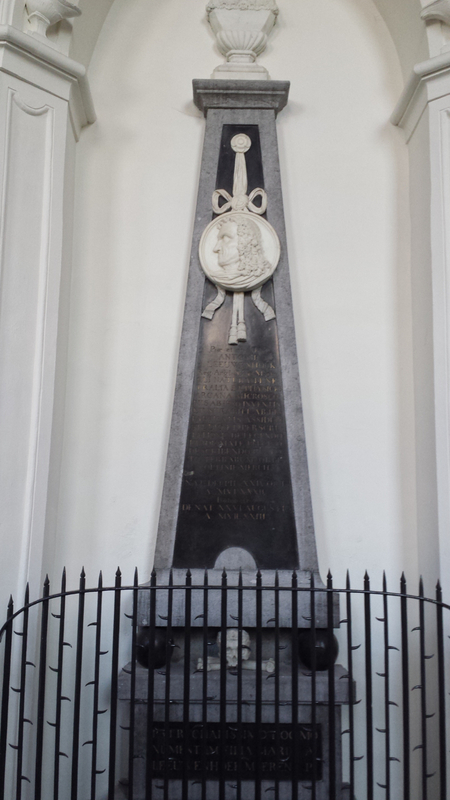 The grave of Antonie van Leeuwenhoek, the "Father of Microbiology"
The memorial to Maarten Tromp, former supreme commander of the Dutch navy and popular hero. 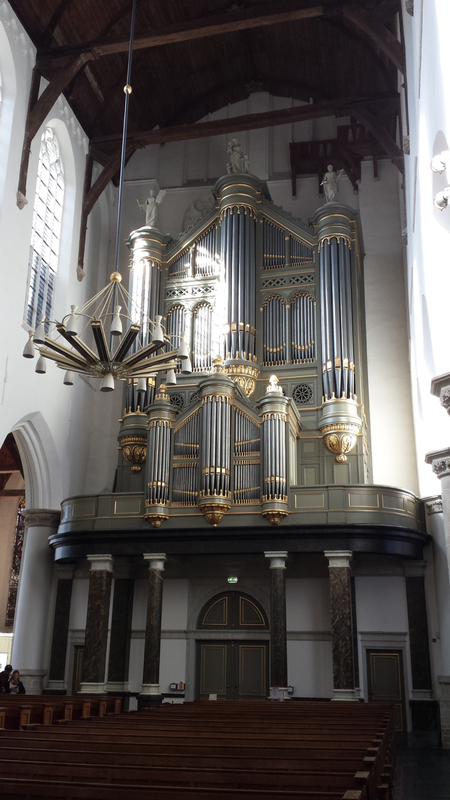 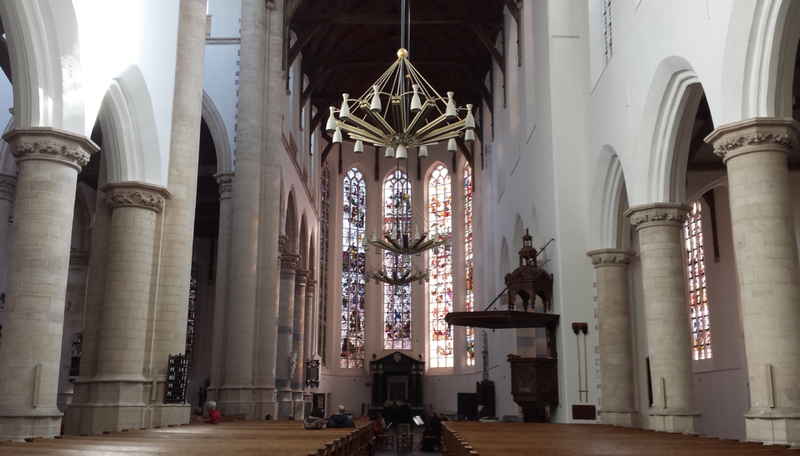 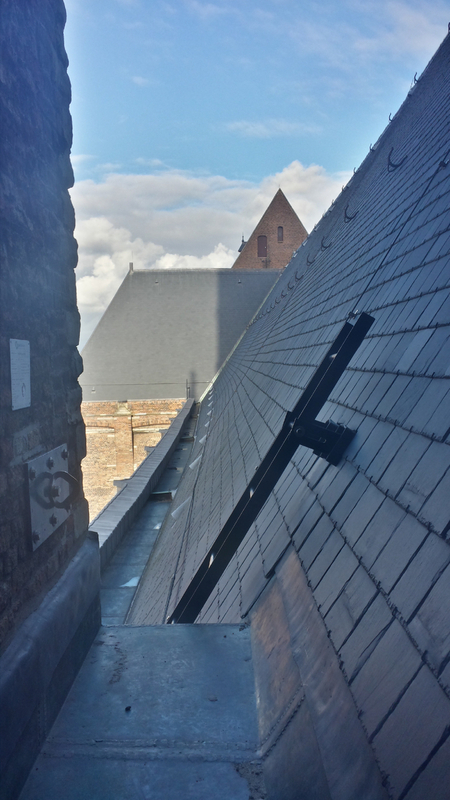 A view of the Oude Kerk from the back of the church (under the organ) looking forward. 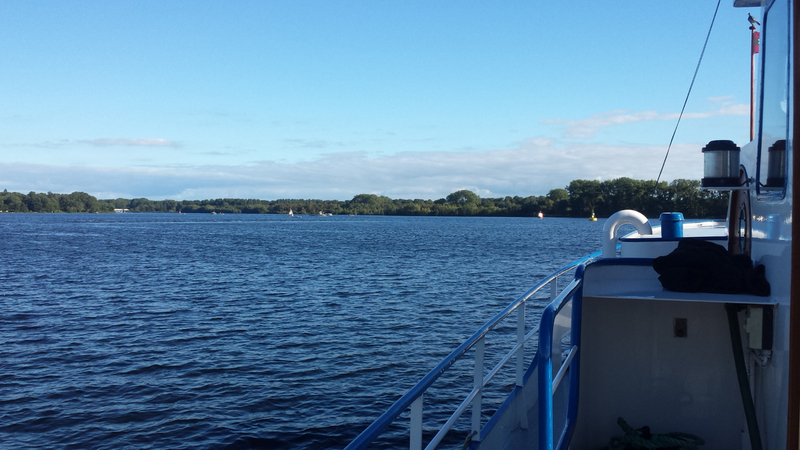 The ferry coming to pick us up. 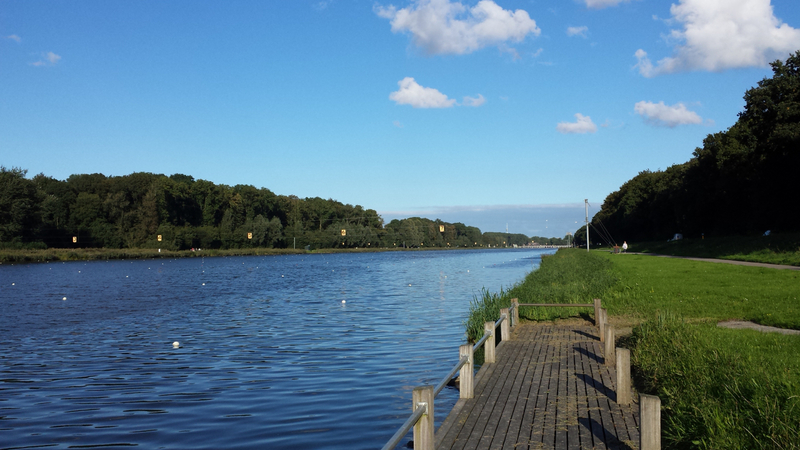 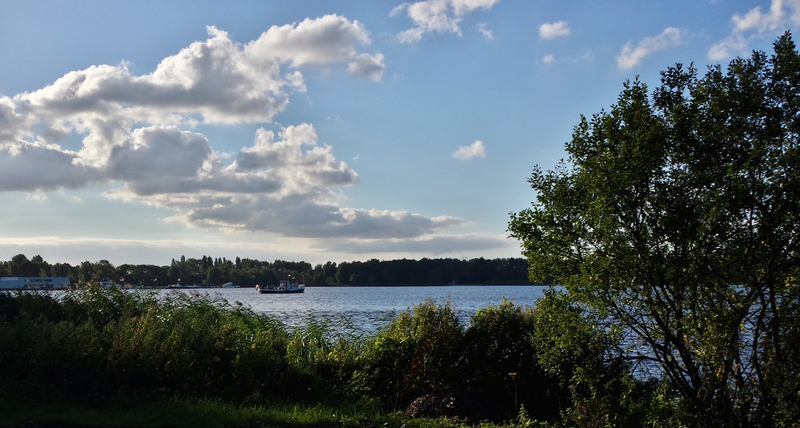 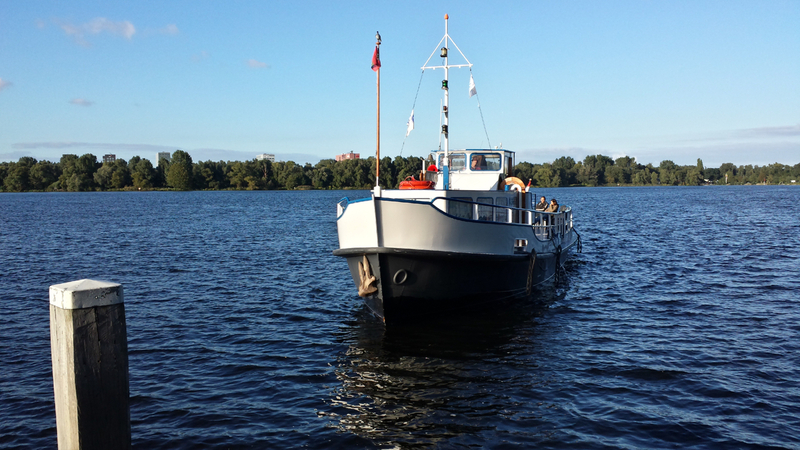 A view of the Nieuwe Meer lake from the ferry. 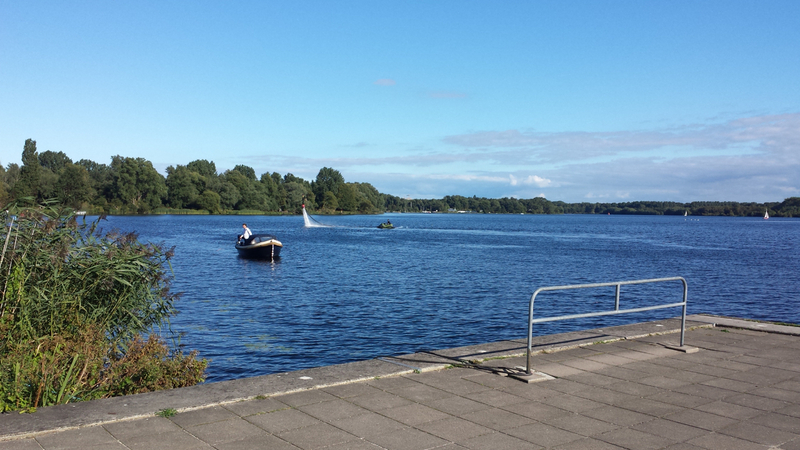 The Nieuwe Meer is a small lake in Amsterdam, and when I was there (a Sunday afternoon) there were lots of people out enjoying the beautiful weather. 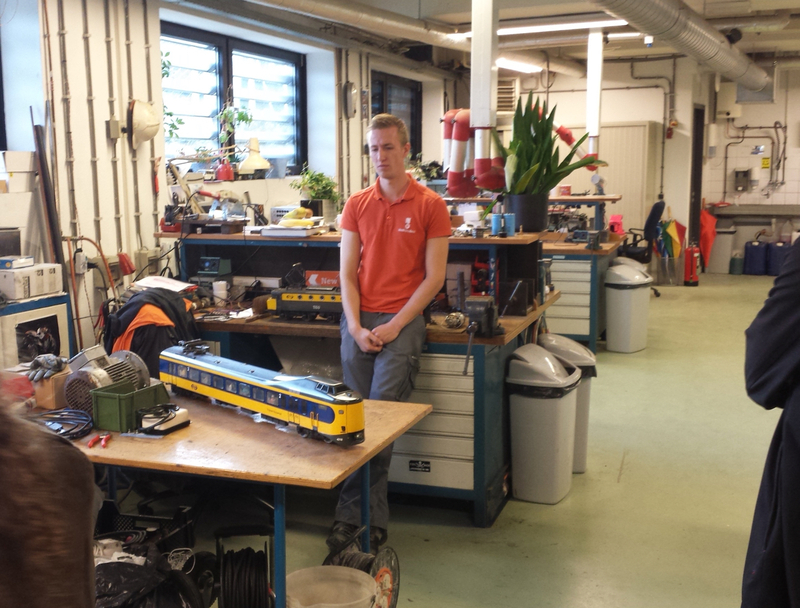 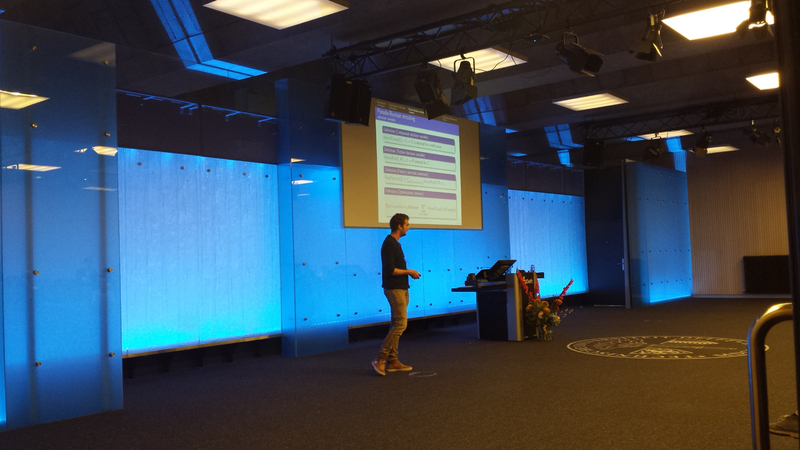 Next PostNext I finished my PhD!